The New York Times sportswriter's described of the outreach program "announced" by Brooklyn Borough President Eric Adams--actually it was the Islanders, as far as I can tell--"to provide vouchers to Brooklyn community groups that would be redeemable for $10 tickets." The Times did clarify what was missing in the press release: 50 to 500 vouchers will be available per game. It didn't clarify how many of those seats would be obstructed views and tough to sell. "The Islanders are Brooklyn's newest home team, and everyone should get a chance to see them and appreciate the game of hockey in person! The first time I went to an NHL game, watching the action on the rink and feeling the energy in the crowd, I was hooked on the experience,” said Brooklyn Borough President, Eric L. Adams. “Hockey can open doors for our youngest Brooklynites, adding another dimension to the sports scene that is an important part of life in our borough. I am proud that the Borough President's Community Pass, a program that represents true corporate citizenship, will open the doors of Barclays Center to residents that may otherwise not get the chance to see the Isles." It's not true corporate citizenship, nor is the team's willingness to a free six-week instruction program for kids, CityParks Street Hockey. However appreciated by recipients, the programs represent savvy corporate spending, which gains positive publicity and distracts from more significant public obligations. True corporate citizenship, as I suggested a year ago, would mean the arena operator and/or team would pay additional fees to Empire State Development, the public agency that formally owns and leases the arena, for the right to have a second professional sports team. That clause was in the 2/18/05 Memorandum of Understanding that Atlantic Yards developer Forest City Ratner signed with New York City and New York State, public parties involved in the Atlantic Yards deal. But it was nonbinding. And Empire State Development refused to answer my queries about it. And public officials like Adams have no interest in pursuing accountability. It was plausible for the public parties to ask for more, because it implies that the arena would gain additional revenue from another team, eased by the significant public contribution--direct subsidies, tax breaks, giveaway of naming rights, override of zoning, inside deal on railyard development rights--that allowed arena construction. When the Barclays Center arena was on the drawing board, fearmongers said Prospect Heights and Park Slope would fill with drunken hordes, especially after basketball games. Fast forward four years. The Nets are in residence. There’s pro wrestling and boxing and concerts from Ariana Grande to Jay Z. The surrounding streets are lively — fans are good for business — but orderly and safe. Now comes professional hockey. The puck drops for the regular season tonight. 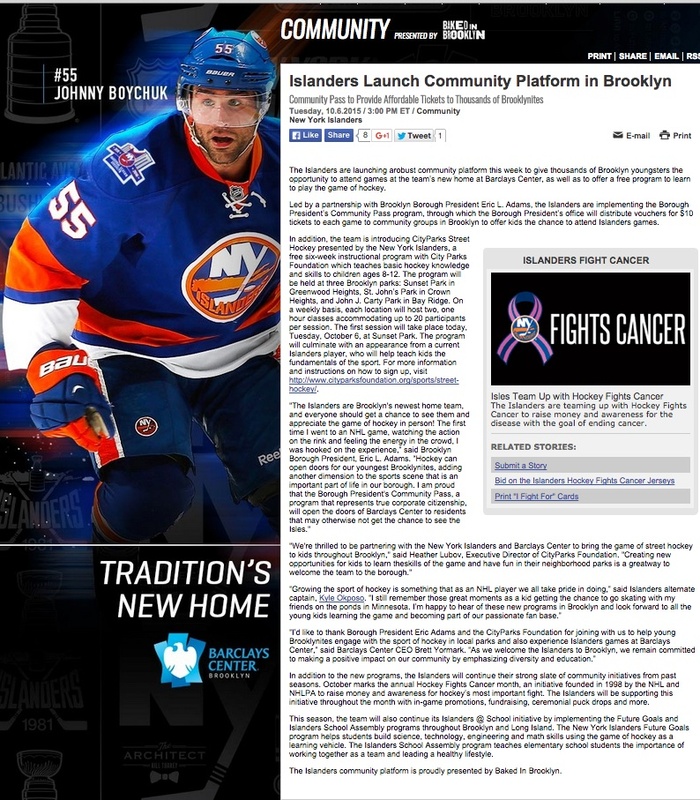 Brooklyn: Say a hearty hello to your New York Islanders. Who surely will not bring drunken hordes coming from out east on the LIRR. Right? Yes, a combination of factors--fewer drivers (loss of New Jersey Nets fans), more people taking public transit, smaller arena capacity after redesign, more people confining food/drink to arena--now suggest that many of the not illegitimate fears were overblown. But the experience does vary. Residents in blocks nearest the arena don't exactly have a peaceful time. Bars draw late-night carousers on 5th Avenue--one resident I just met the other day complained about noise and urination near her residential window--and a good chunk of limos/black cars like to idle or park illegally on neighborhood streets. And of course the lack of residential parking permits means that arenagoers often claim street parking ahead of those who used to drive home after work.